Grace Connolly has been relatively quiet the last few months. The junior standout from Natick High was at her mid-season best at Saturday's Coaches Invitational. Connolly easily captured the mile run with a record time and outdoor PR of 4 minutes, 53.90 seconds (US #18). She broke the MR of 4:57.99, set in 1999 by top U.S. distance runner and Marblehead alum Shalane Flanagan. Finishing second was Lynnfield's Kate MItchell, who registered a big-time PR of 4:59.22 to secure second overall. Hopkinton's Schuyler was third in 5:06.72. 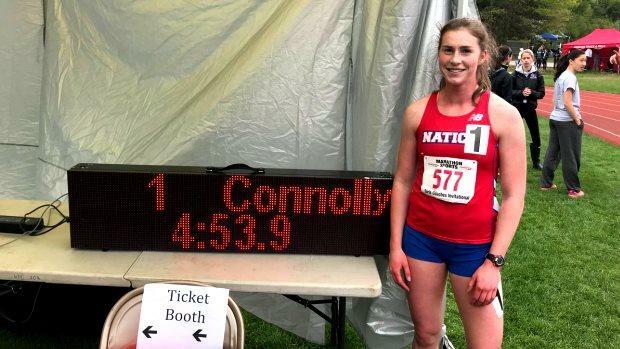 For Connolly, Saturday's race was her first major meet since finishing fourth in the Junior Mile at the New Balance Grand Prix in late January, a meet she ran her all-time best of 4:51.28. Springfield Central's Kyla Hill, the state's top sprinter, was a double winner in the meet. She claimed both titles in the short sprints, winning the 100-meter dash in 12.48 and the 200m in 25.74. In the 100m. she outdistanced Natick's Rachelle Parker, who was second in 12.72. Kimesha Lewis of Lowell was a runner-up to Hill in the 200m with her time of 26.10. As expected, the 400m produced a solid group of sub 60-second finishers with West Roxbury's Jahphiah Gilliard winning the individual crown with a time of 57.52. Hopkinton's Caitlyn Halloran was second at 58.34, just ahead of Beverly's India Ingemi of Beverly, who was third in 58.36. Two other runners in the field dipped under a minute - Plymouth North's Caitlin Haley (fourth, 59.17) and Milford's Kerry O'Connor (fifth, 59.97). Woburn's Alexina Hurley, a second-place finisher in the mile at last week's Twilight Invitational, captured the 800m with a more than three-second best of 2:16.17. Julia Hovasse of Burlington was second at 2:18.34. Nauset's Isabelle Nobili was third in 2:18.41. Sophomore Stephanie Simon of Chelsea cleared 5 feet, 4 inches to win her second big title in as many weeks in the high jump. Last week, she leaped a meet record and state-leading height of 5-5. Seekonk's Cameron Garabian continued her dominance in the shot with a first-place heave of 40-7.75.